Mike C. Erickson grew up in the idyllic college town of Logan, Utah, but because of a twist of fate he graduated from high school in Honolulu. He left Hawaii brimming with aloha and enrolled at Utah State, where he was awarded two degrees and self-proclaimed minor intellectual status, which was of dubious value when the US Army invited him to vacation in South-East Asia. Ten days after leaving Vietnam, he began decades of dispensing pearls of wisdom as a high school history teacher, academic decathlon coach, and on occasion, as a community college instructor in the Sacramento area. Mike and his wife Trudy, have two grown sons and a grandson born soon after this novel is published. When not in Hawaii or another exotic locale, they live in Gold River, California. This is his first novel. Pianist In A Bordello by Mike Erickson is a satirical take on today’s political world and gives us a look at politics and politicians if they were truly honest with the voters. With the presidential campaigning going on, this was a refreshing read. I really loved this book. It was humorous and very entertaining. The novel follows Richard Youngblood, an aspiring Congressman who becomes the true advocate of honesty when he decides to be honest with his voters. In his autobiography, we learn about his past, how his advisers and friends tried to stop him, and how he came to be. Given a name that was meant to be a stab at his absentee father and his colorful college days, we learn that Richard Youngblood is not as different from us as we think a politician is. He is human and, like all, he has faults too. Only he is strong and brave enough to share his faults with the rest of the world and not hide them. Although I don’t really enjoy such books or novels, this was an exception. 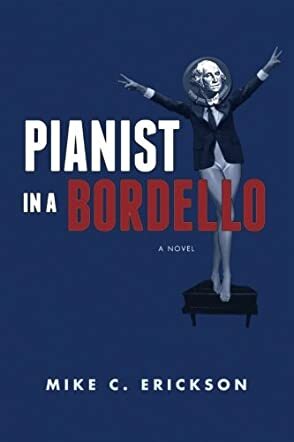 Pianist In A Bordello is a fine and funny novel that often made me laugh out loud. The way Mike Erickson handled the genre and made it entertaining for an average reader was also quite commendable. It was written in sync with the flow and the demand of the story. There is nothing that I wish could be improved because it is amazingly good just the way it is. If you are a fan of Fitzgerald, you will love this.